For today's post, I decided to share an unboxing video with you all. 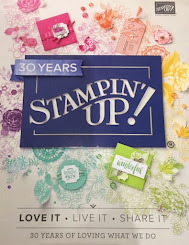 I don't always do these kinds of posts or videos but since I was SO excited about the new goodies coming from the 2018-2019 catalog, I thought I would share it! I sure do...it always puts a smile on my face! I think part of my excitement with this order was it also contained all of the designer series papers for my paper share. This was my very first paper share and I couldn't wait to see all of those gorgeous papers! Paper Shares are a lot of work but totally worth it! It really is a great way to check out our papers and see which ones you absolutely love and need more of. I know for me sometimes being able to see the paper in person helps me decide if I really do LOVE it or not. Believe me there have been times where I love some of the papers in the stack but not all of them. I'm sure I'm not the only one. But in this catalog, there are definitely a few stacks that I do love each and every piece. Well enough about paper, check out today's video to see more goodies. I look forward to being back later this week with a new project!